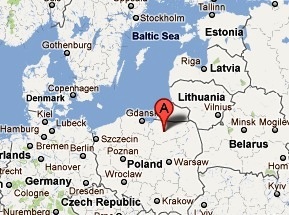 Allenstein is an area in present-day northeastern Poland covering around 4500 miles. It was a district of East Prussia from 1905 until 1945. The territory is currently part of the Polish Warmian-Masurian Voivodeship. Following World War I, a plebiscite was held here (East Prussian plebiscite) in 1920 to determine whether the areas population wished to remain in East Prussia or become part of Poland. The plebiscite was held on July 11 and almost 98% of the voters chose to remain part of East Prussia. Following the defeat of Germany in World War II, the area was placed under Polish administration and renamed as Olsztyn. The German population of the area was expelled in October 1945. A number of stamps issued in the area to publicize the plebiscite of 1920 form the entire set of stamps of Allenstein. None of the stamps were original issues, but rather were overprints on German stamps from the 1906 to 1920 timeframe. The first issues were a set of fourteen stamps that were ‘Plebiscite Olsztyn Allenstein’ overprints on German stamps. The set (Scott #1 to #14) started selling on April 3rd 1920 and became invalid on August 20. Despite the fact that the stamps were used only for a few months, the first set is remarkably inexpensive, cataloging at around $50 MNH and around $30 Used. The designs on the original German issues included Germania allegory, General Post Office in Berlin, Union of North and South Germany, Unveiling Kaiser Wihelm I Memorial in Berlin, etc. Another set of fourteen stamps using a different overprint design was also issued. That set (Scott #15 to #28) on the same original issues of Germany featured a different overprint that read ‘Traite De Versailles Art .94 et .95’ inside an oval border that had the inscription of the plebiscite commission. The overprint refers to the Treaty of Versailles Articles 94 and 95 that dealt with Allenstein’s right to hold a vote to self-determine their national preference. The set (Scott #15 to #28) catalogs for around $70 MNH and around $50 Used. Inverted and Double Overprint varieties are known to exist and they fetch a huge premium that runs well into the 100s for each example. Overprints that were not regularly issued are also known to exist for certain denominations and they also catalog in the $100 range for MNH. Historically relevant photographs and reproductions from the early 1900s are a good collectible item from the area.